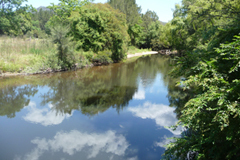 The Manning catchment is on the New South Wales (NSW) mid-north coast. Bordered in the north-east by the Hastings catchment, in the north by the Macleay catchment, in the north-west by the Namoi catchment, south-west by the Hunter, and to the south by the Karuah catchment - the Manning catchment area is about 8,420 square kilometres. Most catchment residents live in Taree and Wingham. Gloucester and Walcha are also major towns in the Manning catchment. The Manning River flows for 250 kilometres, rising in the Great Dividing Range to the east of the basin, and flowing south-east through a coastal floodplain to Taree where it splits in two. The southern arm meets the Pacific Ocean at Old Bar, and the northern arm is joined by the Dawson and Landsdowne rivers, meeting the ocean at Harrington. Other major tributaries include the Avon, Rowleys, Nowendoc, Barnard, Little Manning, Barrington and Gloucester rivers. The Lower Manning River is a delta system with several channels creating large islands like the Mitchells and Oxley islands. The department monitors the conditions of river systems in NSW and provides regular updates on water levels, rainfall, water temperature and electrical conductivity. View real-time data from the Manning catchment on this website. Major water users relying on the catchment's rivers and estuarine resources include local councils, water utilities, conservation, livestock grazing (dairy), oyster farming, coal mining, gravel extraction, manufacturing, agriculture, forestry, fisheries and tourism. Major issues include high bacteriological levels in the Gloucester River at Gloucester, loss of riparian vegetation, with altered stream form and subsequent loss of water storage during droughts. Due to a high density of rural settlement, the region's rivers and estuaries tend to be affected by changed run-off conditions caused by land clearing, agricultural use, human settlement and recreation. Most of the rivers and creeks in the Manning River basin are unregulated, with no major storages to capture and control flows. Most water users rely on natural flows or small structures, such as weirs for their water supplies. As in most unregulated rivers, flows are most affected during relatively dry times, when water is low and demand high. Much of the middle and lower sections of the catchment are highly fertile due to the weathering of volcanic deposits in elevated areas. The impact of human activity on the Manning catchment includes both point source and non-point source (diffuse) pollution of waterways. Other human impacts include the changed patterns of vegetation cover caused by altered land use patterns and specific land management practices, and flow manipulation through storage and consumptive use of the waters. About 22% of the catchment is heavily timbered and managed by the Forestry Corporation of NSW for forestry, recreation, education, research and environmental purposes. Most of the forested areas are located on relatively steep country. To preserve water resources in river and groundwater systems for the long term, it is critical to balance the competing needs of the environment and water users. Water sharing plans establish rules for sharing water between the environmental needs of the river or aquifer, and water users, and also between different types of water use such as town supply, rural domestic supply, stock watering, industry and irrigation. Visit Water Sharing Plans for a status update.